MaPatagonia Outdoor Hostel is located in an old colonial house of Puerto Varas, built by a German settler about 85 years ago. Gigantic, high ceilings, all wooden, and heated by a fireplace, Margouya Patagonia, takes you back to the colonial past of southern Chile as soon as you step inside. However, we're not in the early nineteenth century. Margouya Patagonia has Internet access and is equipped with WiFi. A spacious frontyard is available for your BBQs and sunbathing. A fully equipped kitchen is waiting your cooking tricks and the living room becomes, every night, the place of conversations in all languages. And more importantly, Margouya Patagonia is the starting point of all the adventures of the gateway to Patagonia. Rafting, Kayaking, Trekking, Biking, Horseback riding, Mountaineering. Days of outdoor activities and adventure before returning home, accompanied by good food and international chats are waiting for you by the fireplace whenever you decide to drop by. Please note that tourists are exempted to pay 19% taxes if they pay with dollars. Tout est parfait dans cette auberge, super accueil, super ambiance, superbe maison ! Merci pour tout Pierre ! Si un jour tu en as marre de retaper des maisons, tu es le bienvenu pour boire un petit cidre au Pays Basque ! Such a great stay at MaPatagonia hostel. Pierre (the owner) and his staff are so friendly and helpful. I only stayed 2 nights there but I can tell you that it was one of the most enjoyable hostel I did in South America. If you can go on Volcano tour with Pierre, go without hesitation, you'll remember that. Merci Pierre, et si tu passes en Bretagne, fait moi signe ! Excellente auberge, propre, spacieuse, bien située mais surtout un personnel ultra attentionné et une atmosphère qui donne envie de prolonger son séjour. Endroit que j’ai bien aimé, Pierre le propriétaire est très accueillant et donne de bons renseignements, le personnel est d’une amabilité et aux petits soins avec la clientèle , je recommande fortement. 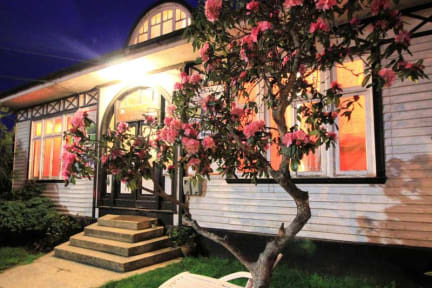 Wonderful place to stay in the heart of Puerto Varas. The owner is exceptional. He was very welcoming and accomodating. He helped us plan our trip and we liked that he shared is experience about Chile. Would recommend to everyone. Exceptional hostal! We travelled for 8 months at the time and this was our best hostel so far ! Nice, clean, warm, funny ! Best employeed and hosts there !